"When I teach Torah classes to my congregants, sometimes they become very uncomfortable with what they read in the Tanach. Jacob tricks his father. Moses kills a man. David commits adultery. They struggle to come to grips with the difficult passages in the text. They also work on finding meaning in worship services, even though they don't know Hebrew. They strive to define themselves proudly as Jews in a non-Jewish world. They worry about assimilation. And I'm pretty sure that they think their problems are modern ones. Blessedly, the rabbis of the Talmud struggled with these questions, too, and they came up with some terrific answers. "In this introduction to the tractate Megillah of the Babylonian Talmud, we will learn how the rabbis viewed the Torah, and how they teach us to relate to it. They don't shy away from the hard-to-deal with passages, but show us how to meet them head on without sacrificing respect for them. They show us how to make the text our own and how to honor it in our everyday lives. These are ancient answers to modern questions. "In this tractate, the rabbis develop a whole system of honor that is based on respect for the Torah in each person and object in our world. In other words, the true Jewish status system is based on learning and menschlichkeit, rather than money or fame. So while this tractate may be stimulating on an intellectual level, it's also stimulating on the mensch' level. 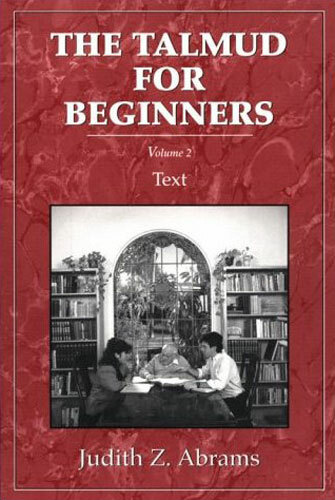 "As the second volume in a series, this book challenges the learner to reach new heights of understanding the Talmud, and the way the rabbis thought. However, don't be afraid, it's still very much for beginners. A general introduction about the Talmud is provided, then selected passages from each of the tractate's four chapters are explained in simple language. A bibliography for further reading, glossary, halachic appendix and descriptions of the rabbis mentioned in the book, are also provided."